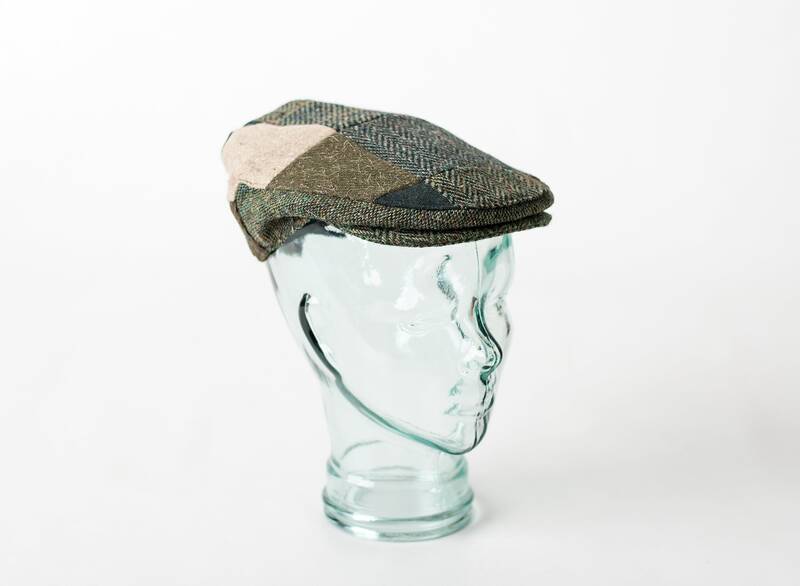 The McCaffrey Irish store is one of the few places you can still get Authentic Handmade Donegal Tweed Flat caps. This is the real deal and crafted from the finest tweeds in Ireland. We don't use the cheaper lighter wools or wool blends but the heavier more expensive tweeds from Northern Ireland where the McCaffrey family originated 800 years ago!. When you feel this Patchwork flat cap you will know the difference. Real tweed is a luxury fabric and is made from 100% wool.Wool is a great insulator and will keep you warm when worn and cool on hotter days. Don't accept synthetic fibers which don't hold their shapes and are poor insulators or even wool blends calling themselves 100% wool !!!! The Patchwork flat cap with red is an unmistakably an Irish design. Each Patchwork cap is handmade from the best cut offs and each cap will look like a one of a kind hat as we use random patches each time. Tweed Patch design flat cap will vary from cap to cap but will have a GREEN patch always. Only accept 100% tweed wool flat caps from a name you can trust. See our reviews and sales and know The McCaffrey name will meet your expectations time and time again. " 1. Get a piece of string.